Preparation and photocatalytic properties of KH-550 modified nano-TiO2/graphene Composites. KH-550 modified nano-TiO2/RGO composites were synthesized via a one-step hydrothermal method to improve the photocatalytic activity of nano-TiO2.The composites were characterized by X-ray Diffraction (XRD), Scanning Electron Microscope (SEM), Transmission Electron Microscope (TEM), Raman spectra, X-ray Photoelectron Spectroscopy (XPS). In addition, methyl orange solution was used in optical degradation to investigate the photocatalytic properties. The results showed that the photocatalytic degradation rate of KH-550 modified nano-TiO2/RGO composites was 57.32% while pure nano-TiO2, nano-TiO2/RGO was only degraded 28.83%, 46.68% during the same time and same mass ratio. Compared with nano- TiO2, the photocatalytic degradation rate of nano-TiO2/RGO and KH-550 modified nano-TiO2/ RGO composites were improved by 17.85%, 28.49% respectively. However, the composites displayed the best photocatalytic performance when the mass ratio of graphene and KH-550 modified nano-TiO2 was 8%. Nano-tio2, graphene, hydrothermal method, composites, photocatalytic degradation rate. Titanium dioxide, commonly known as titanium dioxide, is a kind of inorganic semiconductor material with various functions and widely used in many fields , which has anatase, rutile and titanium plate type 3-types of crystal forms [2,3]. So the morphology is more diverse and easy to control when we synthesized . However, nano titanium dioxide shows strong surface activity because of its large specific surface area On the other hand, it is lack of coordination [5,6] that form a plurality of weakly bonded interface with larger size aggregates and influences the effectiveness of its application directly. Besides, nano-TiO2 also has many other advantages such as high chemical stability, non-toxic, non-selective degradation of organic matter . It is photocatalyst that most talked about and has broad application prospects currently. But it turns out to be more difficult to improve the photocatalytic performance due to its own limitation, for example, the carrier is easy to compound and the utilization rate of light is low [8-10]. In recent years, there have been many studies on the formation of nano carbon materials and nano-TiO2 composites, the composite materials we obtained not only have the excellent conductive and optical properties of the carbon materials but also excellent photocatalytic properties of nano-TiO2 [11,12]. Graphene, which consists of single layer and sp2-hybridized carbon lattice with a remarkably high crystal quality and good electronic property . Planar hexagon is the ideal structure of grapheme, a strong Sigma (σ) bond was formed between each carbon atom and 3 carbon atoms in the vicinity, but remaining a P electron was perpendicular to the graphene plane, which forms a big Pi (π) bond with surrounding atoms throughout the whole layer. The P electrons can move freely so that graphene has good electrical conductivity . Since its discovery in 2004, graphene has become a new research hotspot because of its excellent electrical, thermal, mechanical and optical properties, and has been widely used in the field of photocatalys is and other fields . In view of its excellent properties, many researchers began to study the photocatalytic properties of composites of graphene and other materials. By making use of the high conductivity of graphene, the composites can be used to prolong the lifetime of the electron and the hole of the light, so as to improve the photocatalytic activity . However, nano-TiO2 prone to accumulation and agglomeration, which plays a certain role in the photocatalytic performance of graphene and nano-TiO2 composite materials . In this paper, KH-550 was used to inhibited the aggregation of nano-TiO2 by grafting the organic groups onto the surface of the nano-TiO2. Then the KH-550 modified nano-TiO2/ RGO composites were prepared by hydrothermal method. The crystal structure, morphology and elemental speciation of the composites were analyzed by XRD, SEM, TEM, XPS and Raman. In addition, methyl orange solution was used as simulated pollutants to discuss the effect of different graphene contents on the photocatalytic activity of the composites. Nano-TiO2 powder, with particle size of 25 nm, and were purchased from Aladdin (Shanghai, China). Sodium nitrate (NaNO3, Shanghai Chemical Reagent Co., Ltd.). Ethanol (Shanghai revitalization of the first chemical plant). Silane coupling agent KH-550 and graphite powder (99.8%) were obtained from Shanghai Aladdin Reagent Co. Toluene, Acetone, hydrochloric acid (1mol/l) and potassium permanganate were acquired from Shanghai Su Yi Chemical Reagent Co. Triethylamine and hydrogen peroxide were products of China sun speciality Co. Barium chloride and Methyl orange were supplied from Sinopharm Chemical Reagent Co. Distilled water directly from the laboratory. Preparation of KH-550 modified TiO2: Quantitative nano- TiO2 was dried at 100°C for 12 h before used. Then drying nano-TiO2 and proper amount of toluene were added into a single-necked flask under ultrasonication for 40 min. The solution was stirred for 1h at room temperature to make it evenly. Next, the corresponding ratio of KH-550 and triethylamine were added with nitrogen gas and heated up to 80ºC. The reflux reaction continued for 24 h. Afterwards, the black KH-550 modified nano-TiO2 precipitate formed in the solution was collected by filtration, which was washed three times with acetone, and dried in an oven at 60°C. After cooling to room temperature, weighing and grinding. KH-550 modified nano-TiO2 powder was obtained. Preparation of graphene oxide: Graphite oxide was prepared using Hummers method from graphite powders . The specific steps are as follows: concentrated H2SO4 (98%) was added to a beaker (250 ml), the solution was cooled below 4ºC. Then graphite powder and NaNO3 was added under magnetic stirring for 1 h to ensure adequate mixing. KMnO4 was added slowly in portions within 5 min to keep the reaction temperature below 4°C. The mixture maintains this temperature stirred for 2 h in ice bath. The beaker was transferred to oil bath. The reaction was warmed to 35 ± 3°C and stirred for 2 h, at which time appropriate deionized water was added slowly, producing a large exotherm to 95°C and continued to stir for 15 min. The reactant shifted into a 500 ml beaker diluted with distilled water to degree scale, and 5% H2O2 were added until the solution became brown. By high speed centrifugation and washed with HCl (5%) until the upper solution has no SO42- (detection by BaCl2). And then wash the upper solution with distilled water until it is neutral. Finally, the reaction liquid was placed in an ultrasonic instrument for 5 h. So graphene oxide solution was obtained. Preparation of KH-550 modified nano-TiO2/grapheme composites: In a typical synthesis of the KH-550 modified nano-TiO2/graphene composites hybrid, 80ml graphene oxide aqueous solution and the quantitative KH-550 modified nano- TiO2 was added under ultrasonication for 30 min. The mixture then moved into the 100ml autoclave and adjusted PH to 3~4 with concentrated HCl. The solution placed in the oven and held at 130°C for 12 h. After air cooling, the mixture was purified by centrifugal separation, multiple washings, vacuum drying, grinding. So KH-550 modified nano-TiO2/graphene composites were obtained. An X-ray photoelectron spectrometer (Thermo ESCALAB 250, Waltham, MA) was used to examine the element composition and valence state of the composites. The molecular structure of the composites was determined by Raman spectrum (DXR Smart). Transmission electron microscopy (TEM, Tecnai 12) and scanning electron microscope (JSM-6480) were used to analyze the morphology and structural details of the samples. The X-ray diffraction (XRD-6000, Shimadzu) of the product was carried out to analyse crystal structure, using Cu Ka radiation (λ=0.154) with the range of 10~80°. The photocatalytic activities of the composites were evaluated by the degradation of methyl orange in a 50 mL beaker, and a 500 W mercury lamp was selected as the visible light source. In a typical experiment, 0.1 g of the as-prepared composites was dispersed in the methyl orange solution (50 ml, 20 mg/L). And then the solution was continued to stir in the dark for 1h, in order to reach the adsorption-desorption balance. During irradiation, 3 mL of the sample solution was taken out every 15 min and analyzed by UV-vis spectroscopy. The degradation rate of methyl orange can be calculated via the formula: η = (1-A/ A0) × 100%, where A0 and A are the absorbance values of the original methyl orange solution and irradiated solution. Figure 1 shows the XRD patterns of different samples, A, B, C and D are nano-TiO2, KH-550 modified nano-TiO2, nano- TiO2/RGO composites and KH-550 modified nano-TiO2/RGO composites in Figure 1, respectively. The specific diffraction peaks of nano-TiO2 can be identified in Figure 1A, the different crystal faces of nano-TiO2 was coincided with JCPDS, which successively was (101), (103), (004), (112), (200), (105), (211), (204), (116), (220), (215). The X-ray diffraction of KH-550 modified nano-TiO2 is shown in Figure 1B, the crystal surface of KH-550 modified nano-TiO2 was as same as nano-TiO2, and the intensity of each peak was similar. The experimental results show that KH-550 modified nano-TiO2 have no effect on structure of nano-TiO2. The X-ray diffraction of nano- TiO2/RGO composites and KH-550 modified nano-TiO2/RGO composites are shown in Figure 1C and 1D. The characteristic peaks are consistent with nano-TiO2, and no characteristic peak of graphene can be found due to the small percentage in the hybrid. According to reports , graphene has a characteristic peak in the vicinity of 23°, so it's easy to hide with strong characteristics of nano-TiO2 (101) crystal plane at 25.3°. Figure 1: XRD pattern of: nano-TiO2 (A), KH-550 modified nano-TiO2 (B), nano-TiO2/RGO composites (C) and KH-550 modified nano-TiO2/RGO composites (D). Figure 2 shows the SEM image of different samples. Figure 2A shows the scanning electron microscopy (SEM) image of nano-TiO2 particles. The phenomenon of agglomeration can be found for the particles, and there is a large gap between the accumulation. This can be account for the small diameter of the nano-TiO2, and its surface has a large number of polar hydroxyl groups and quantitative surface energy, so that the particles appear to be agglomerated together. Compared with Figure 2A, there is no accumulation and aggregation phenomenon between the sample particles (Figure 2B). The reaction of KH-550 with the hydroxyl group on the surface of nano-TiO2 is supposed to be the crucial reason for the phenomenon. During the reaction, the surface of nano-TiO2 grafted with the organic group, the interaction between molecules make the particles separated, which inhibits the phenomenon of agglomeration. The nano- TiO2/RGO composites is formed on the basis of nano-TiO2 in Figure 2C, in which things like cotton attached to the nano-TiO2, and it has proved to be graphene. However, the accumulation and agglomeration of nano-TiO2 has not disappeared yet. The experimental results show that it has no impact on the overall structure of nano-TiO2 although graphene was attached to the nano-TiO2 surface. The SEM image in Figure 2D proves a uniform distribution and small voids between the composites. Figure 2: SEM image of: nano-TiO2 (A), KH-550 modified nano-TiO2 (B), nano-TiO2/RGO composites (C) and KH-550 modified nano-TiO2/RGO composites (D). Graphene was attached to the entire surface and more regular, and the phenomenon of accumulation and aggregation has not appeared. All these results indicate that KH-550 functioned well as a good modifying agent to reduce the phenomenon of agglomeration. Transmission electron microscope analysis of different samples: Figure 3 shows the TEM image of different samples. 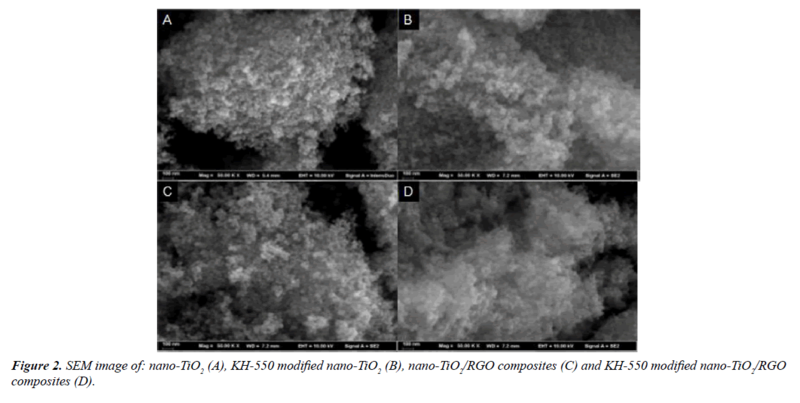 Figure 3A-3C are nano-TiO2, nano-TiO2/RGO composites and KH-550 modified nano-TiO2/RGO composites, respectively. Figure 3A shows that both ends of the particles appeared the phenomenon of accumulation and aggregation. This is due to a large number of polar hydroxyl groups and quantitative surface energy in the nano-TiO2 surface. Graphene is the structure of two-dimensional layer with many folds on the graphene sheets, which are the characteristics of single layer grapheme . The Figure 3B proves grapheme with many wrinkle lines, and also a lot of particles on the grapheme can be found, these particles are nano-TiO2. The phenomenon of aggregation and accumulation of nano-TiO2 on grapheme in the composites of nano-TiO2 and grapheme, this is due to the graphene is loaded matrix, the structure and properties of nano-TiO2 can't change. KH-550 modified nano-TiO2 evenly dispersed on grapheme in Figure 3C, this is due to the reaction of KH-550 with the hydroxyl group on the surface of nano-TiO2, which the surface of nano-TiO2 grafted with the organic group, the interaction between molecules separate the particles, thus inhibiting the phenomenon of agglomeration, so KH-550 modified nano-TiO2 dispersed evenly on graphene. Figure 3: TEM image of: nano-TiO2 (A), nano-TiO2/RGO composites (B) and KH-550 modified nano-TiO2/RGO composites (C). Figure 4 shows the XPS pattern of different samples, Figure 4A-4C are nano-TiO2, nano-TiO2/RGO composites and KH- 550 modified nano-TiO2/RGO composites, respectively. The XPS full spectrum of nano-TiO2, nano-TiO2/RGO composites and KH-550 modified nano-TiO2/RGO composites have Ti, O elements in the pattern, 529.6 eV and 458.9 eV are the characteristic peaks of O 1s and Ti 2p, respectively. The XPS full spectrum of nano-TiO2/RGO and KH-550 modified nano-TiO2 composites compared with nano-TiO2 appeared the characteristic peaks of C and N elements. 285.5 eV and 399.2 eV are the characteristic peaks of C 1s and N 1s, respectively. This is due to the graphene is mainly composed of C elements, and nano-TiO2/RGO and KH-550 modified nano-TiO2/RGO composites are synthesized on the basis of grapheme, so the XPS full spectrum of nano-TiO2/RGO and KH-550 modified nano-TiO2/RGO composites appeared the characteristic peak of C element. However, the XPS full spectrum of KH- 550 modified nano-TiO2/RGO composites appeared the characteristic peak of N element, this is due to the reaction of KH-550 with the surface hydroxyl group of nano-TiO2, and grafted on the organic group, since the chemical formula of KH-550 has N element, so the characteristic peak of N is appeared. Figure 4: XPS spectra of: nano-TiO2 (A), nano-TiO2/RGO composites (B) and KH-550 modified nano-TiO2/RGO composites (C). Raman spectroscopy as an effective analytical method, and apply to sp2 and sp3 hybrid applications in the characterization of carbon atoms on the graphene plane, used for study the disordered arrangement and defect of the carbon atoms on the surface of grapheme, raman vibrational peak of carbon atom SP2 plane are located at 1601 cm-1, and commonly called G band, corresponding to the D band is located at 1344 cm-1, this is raman vibrational peaks of SP3 hybrid. By comparing the peak intensities of D bands and G bands, the degree of disordered carbon atoms on the graphene plane can be expressed indirectly . Figure 5A-5C shows that the D band and G band peak intensity of nano-TiO2/RGO and KH-550 modified nano-TiO2/ RGO composites are similar, the degree of disorder with both of grapheme are similar, which proves similar disorder degree between these two kinds of graphene. In addition, there have three raman vibration peaks in 394 cm-1, 518 cm-1 and 640 cm-1, corresponding to three vibrations of B1g, A1g and E g bands in nano-TiO2 . Figure 5: Raman spectra of: nano-TiO2 (A), nano-TiO2/RGO composites (B) and KH-550 modified nano-TiO2/RGO composites (C). Figure 6 shows that the photocatalytic activity of nano- TiO2 (PT), 2% nano-TiO2/RGO (RGOT-2%) and KH-550 modified nano-TiO2/RGO composites with different mass ratios under visible light, KH-550 modified nano-TiO2/RGO with different mass ratio are 2% KH-550 modified nano- TiO2/RGO (RGOMT-2%), 4% KH-550 modified nano-TiO2/ RGO (RGOMT-4%), 6% KH-550 modified nano-TiO2/ RGO (RGOMT-6%), 8% KH-550 modified nano-TiO2/RGO (RGOMT-8%) and 10% KH-550 modified nano-TiO2/RGO (RGOMT-10%), respectively. Nano-TiO2 photocatalytic degradation rate of methyl orange increases with time as shown in Figure 5. After the combination of nano-TiO2 and grapheme, the photocatalytic degradation of methyl orange with composites was increased significantly. By incorporation of nano-TiO2/RGO, the photocatalytic degradation of methyl orange with KH-550 modified nano-TiO2/RGO composites was further increased. However, further increase of the mass ratio of graphene and KH-550 modified nano-TiO2 to more than 8% led to a decrease of its photocatalytic activity. For pure graphene, proving the poor photocatalytic activity under visible light. 8% KH-550 modified nano-TiO2/RGO composites displayed the best photocatalytic performance, with the photodegradation rate of 91.01% in 90 min. But the photodegradation rate of 10% KH-550 modified nano-TiO2/ RGO composites was only 87.95%. The experimental results show that the additive amount of graphene can improved the photocatalytic performance of KH-550 modified nano-TiO2, however, further increase of graphene plays an inhibitory effect on the photocatalytic properties of KH-550 modified nano-TiO2. The photodegradation rate of nano-TiO2 was 28.83% in 90 min, in the same time, the photocatalytic rate of 8% KH-550 modified nano-TiO2/R composites was higher than nano-TiO2 and more than 62.18% during the same time. At the same time, by comparing the RGOT-2% and RGOMT-2%, the photocatalytic rate of KH-550 modified nano-TiO2/RGO composites was higher than nano-TiO2/RGO composites and more than 10.64%. In summary, the additive amount of graphene and the surface modification of nano-TiO2 is beneficial to improve the photocatalytic activity. Figure 6: Light catalytic performance curves of different samples(nano-TiO2(PT), 2% nano-TiO2/RGO (RGOT-2%), 2% KH-550 modified nano- TiO2/RGO(RGOMT-2%), 4% KH-550 modified nano-TiO2/RGO(RGOMT-4%), 6% KH-550 modified nano-TiO2/RGO (RGOMT-6%), 8% KH- 550 modified nano-TiO2/RGO(RGOMT-8%), 10% KH-550 modified nano-TiO2/RGO(RGOMT-10%), respectively. A KH-550 modified nano-TiO2/RGO was synthesized by a facile hydrothermal method. The crystal structures of nano- TiO2 have not changed by XRD analysis test. KH-550can obviously reduce the phenomenon of agglomeration, and the composites formed by KH-550 modified nano-TiO2 and graphene exhibited a serious of advantages such as uniform distribution, regular and no voids by SEM and TEM analysis test. Based on XPS and Raman spectral analysis, KH-550 modified nano-TiO2/RGO composites has a certain degree of disorder. The KH-550 modified nano-TiO2/RGO composites displayed a much greater photocatalytic activity than nano- TiO2 and nano-TiO2/RGO composites under visible light (λ ≥ 420 nm). This can be contributed to the modification of nano-TiO2 by KH-550 and doping of grapheme. Surprisingly, further increase of graphene content in the composite led to a decrease of its photocatalytic activity. It is proven that the composites modified with 8% graphene possessed the best photocatalytic performance. Qiu S, Kalita SJ. Synthesis, processing and characterization of nanocrystalline titanium dioxide. Materials Science & Engineering A. 2006; 435-436(4):327-32. Yao H, Fan M, Wang Y, et al. Magnetic titanium dioxide based nanomaterials: synthesis, characteristics, and photocatalytic application in pollutant degradation. Journal of Materials Chemistry A. 2015;3(34):17511-24. Tamura K, Bardi U, Nihei Y. X-ray photoelectron diffraction study of platinum particles deposited on rutile titanium dioxide. Surface Science Letters. 1989;216(216):209-21. Chen X, Mao SS. Titanium Dioxide Nanomaterials: Synthesis, Properties, Modifications, and Applications. Chemical Reviews. 2007;107(7):2891-2959. Mikhailov MM, Li C, Neshchimenko VV. Optical property degradation of titanium dioxide micro- and nanopowders under irradiation. Nuclear Instruments& Methods in Physics Research. 2014;333(9):52-7. Veréb G, Ambrus Z, Pap Z, et al. Comparative study on UV and visible light sensitive bare and doped titanium dioxide photocatalysts for the decomposition of environmental pollutants in water. Applied Catalysis A General. 2012;417-418(1):26-36. Ismail AA, Bahnemann DW. Mesoporous titania photocatalysts: preparation, characterization and reaction mechanisms. Journal of Materials Chemistry. 2011;21(32):11686-707. Nguyen-Phan TD, Pham VH, Shin EW, et al. The role of graphene oxide content on the adsorption-enhanced photocatalysis of titanium dioxide/graphene oxide composites. Chemical Engineering Journal. 2011;170(1):226-32. Dong H, Zeng G, Lin T, et al. An overview on limitations of TiO2-based particles for photocatalytic degradation of organic pollutants and the corresponding countermeasures. Water Research. 2015;79:128-46. Umezawa N. Recent advances in TiO2-based photocatalysis. 2014. Kamrannejad MM, Hasanzadeh A, Nosoudi N, et al. Photocatalytic degradation of polypropylene/TiO2 nano-composites. Materials Research. 2014;17(4):1039-46. Huang Z, Zhang J, Yang X, et al. Photoelectric study on a new semiconductor: 6,13-diphenylpentacene and TiO2 nano-composites film. Journal of Materials Science Materials in Electronics. 2010;21(11):1137-43. Okada T, Okamura A, Kosuge Y. Emission and Detection of Terahertz Radiation Using Two-Dimensional Electrons in III-V Semiconductors and Graphene. IEEE Transactions on Terahertz Science & Technology. 2013;3(1):63-71. Ilyasov V, Meshi B, Ryzhkin A, et al. Materials for Spintronics: Magnetic and Transport Properties of Ultrathin (Monolayer Graphene)/MnO (001) and MnO (001) Films. Journal of Modern Physics. 2011;2:1120-35. Putri LK, Ong WJ, Wei SC, et al. Heteroatom doped graphene in photocatalysis: A review. Applied Surface Science. 2015;358:2-14. Khalid NR, Ahmed E, Hong Z, et al. Synthesis and photocatalytic properties of visible light responsive La/TiO2-graphene composites. Applied Surface Science. 2012;263(48):254-59. Štengl Václav, Henych J, Vomá?ka P, et al. Doping of TiO2-GO and TiO2-rGO with NobleMetals: Synthesis, Characterization and Photocatalytic Performance for Azo Dye Discoloration. Photochemistry & Photobiology. 2013;89(5):1038-46. Stankovich S, Dikin DA, Piner RD, et al. Synthesis of graphene-based nanosheets via chemical reduction of exfoliated graphite oxide. Carbon. 2007;45(7):1558-65. Liu X, Zhang JM. Synthesis and Characterization of Graphene. Liaoning Chemical Industry. 2013;128 (5):2746-52. Zhang J, Xiong Z, Zhao XS. Graphene-metal-oxide composites for the degradation of dyes under visible light irradiation. Journal of Materials Chemistry. 2011;21(11):3634-40. Rao CNR, Sood AK, Subrahmanyam KS. Graphene: The New Two-Dimensional Nanomaterial. Angewandte Chemie International Edition. 2009;48(42):7752-77. Huang X, Yin Z, Wu S, et al. Graphene-Based Materials: Synthesis, Characterization, Properties, and Applications. Small. 2011;7(14):1876-1902.